One of the most common questions that calligraphy beginners have is what pen should i start with? Answering this question right off the bat is not as simple as you may think, mostly because the answer could be different from person to person. Simply put – the best calligraphy pen for beginners depends on what kind of calligraphy style (script) you want to learn. Let me present this from a different perspective. Imagine someone asking – what is the best ball for sports? You would probably wonder, well which sport exactly? This is exactly why I decided to create a guide that will help you not only answer the question about the best calligraphy tool, but also to understand why the answer could be different depending on your intent. What is the best calligraphy pen to start with? What other tools you need to start? Don’t worry, i completely understand that from a beginners perspective this may seem complicated, but believe you will be glad that you’ve read this post. It’s really important to understand these things before you go out and start spending money on various calligraphy kits or fancy fountain pens. First we will have a look at the different calligraphy styles (scripts) and then i will give you a recommendation based on the style (script) you are interested to learn. Ok, let’s cut the chit chat and let’s get down to work! As we talked in some of our previous articles, calligraphy is the art of beautiful writing and it’s performed with a variety of specific tools created for that purpose. HOWEVER, calligraphy is a broad term and there are bunch of different scripts and styles that fall under that term. This is exactly the reason why the answer to – ‘’what is the best calligraphy pen’’ could vary from person to person. For example, a tool for blackletter (gothic) calligraphy has a specific design that you simply won’t be able to (or you will have a very hard time) to create i.e. the copperplate calligraphy script. Before you start watching tutorials or buying any supplies there is a very important question you should ask yourself that could determine your direction. That question is – What calligraphy script do i want to start to learn? Once you’ve figured out that part you can start searching for educational resources and you can start buying supplies for it. don’t worry, that’s why we are here! There are hundreds of different calligraphy scripts that you can practice, but we will just go through some of the most popular – we want to avoid too much confusion, especially in the early steps of your calligraphy journey. Also, it’s important to mention that many scripts can be performed with the same tool, so it’s not like you will have to spend a whole bunch in order to get started – we will get to that part a bit later. For now let’s have a quick overview on the different (popular) calligraphy scripts – by popular i mean what i personally see most frequently across social media platforms. I have divided the calligraphy scripts in groups that are based on the same calligraphy tool which will help you to understand their similarities. If you would like to learn more about the different calligraphy styles and scripts i HIGHLY recommend you getting yourself this book by David Harris. In this group we have all the scripts (most popular) that are performed with a broad (wide) nib. There are many more scripts that were developed through the history of western calligraphy, but these are the ones i see are being practiced the most. The second group is all about scripts performed with a pointed nib. Modern calligraphy is basically a style that deviates from the rules of traditional calligraphy scripts. I think there are a lot of mixed feelings when it comes to modern calligraphy, from my point of view it really seems like some are against this technique while other don’t practice nothing but modern calligraphy styles. Personally i enjoy both, i love the rich history behind the traditional calligraphy and the vast variety of well established calligraphy scripts, and i also enjoy the freedom behind modern calligraphy. I would argue that both have their pros and cons, and to be honest i think that you should always try to step out of your comfort zone and push your creative boundaries. Making a decision – and sticking to it! Now that you have an overview on some of the different calligraphy styles, i would encourage you to take your time and decide which one you would like to start with. In case you are a total beginner i would highly suggest to pick one and stick to it for the first month or two (at least). This should give you enough time to understand the basics and fundamentals of calligraphy, and at that point you can start exploring different scripts. Skipping from one script to another as a complete beginner will definitely slow down your progress and on top of that it will cost you more – and that’s something we want to avoid. Ok, now that you understand that ‘’the best pen for calligraphy’’ highly depends on your choice we can proceed to the recommendation part. Let me start this part by saying that you absolutely do not need fancy tools to do calligraphy – and more important, a more expensive tool will not improve your skills. Quite often i see on various Facebook groups people linking to calligraphy kits (50$+ in value) and asking if these are good for beginners. Starting with calligraphy doesn’t need to be expensive at all, and there is a variety of tools that are good quality and do not cost a fortune. If you are interested to start with a calligraphy script that is performed with a broad (wide) nib pen, the best tool you can start with is the Pilot Parallel pen. This is one of the most popular calligraphy tools and for a good reason! The Pilot Parallel pen is basically a fountain pen with two flat metal plates pressed at each other as the tip of the pen. For those who don’t know what a fountain pen is – it’s a pen that has ink cartridges stored in the body of the pen instead of having to dip the pen in the ink every few strokes. My personal favorite is the 3.8 mm one which gives you neither too big or too small strokes. You can get the whole set (all 4 of them) for around 20$ and if you are really on a budget, the single pen is around 8$. Each pen comes with two ink cartridges, a nib cleaner and small booklet – like an instructional manual that guides you through some basic strokes. If you want to stock up on the ink cartridges, Pilot has an offer of 3 boxes (12 cartridges each) for around 8$ – i would highly recommend that you only use the ink cartridges made by Pilot. I’ve heard other people saying that using different brands may cause issues like clogging the metal nib. In case you are interested in a calligraphy script that requires a broad (wide) nib tool (like the ones we mentioned earlier), the Parallel Pen is definitely your top choice! For this category things are a bit different. We have to turn to more traditional tools as there aren’t any reliable options for fountain pens. The first thing you need to choose is whether to go with a straight holder or an oblique holder – my pick here goes definitely to the oblique holder. 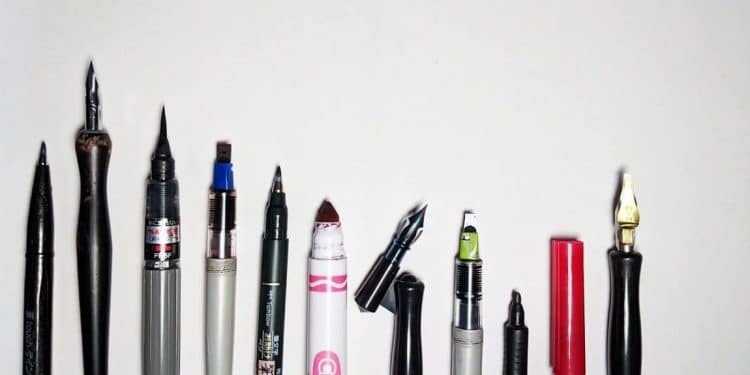 You see using these tools require you to learn and master a different kind of hold – you don’t hold and write with these pens like you do with a normal ballpoint pen. The oblique pen holder allows you to hold the pen in a more comfortable position, and at least in my case, i found it much easier to handle compared to the straight holder. Aside from the pen holder we have the calligraphy nibs. There are a lot of different nibs and they all vary in sizes, flexibility etc. I’m going to make your life easier and simply recommend an affordable set so you don’t have to hunt the parts individually. In this set you get an oblique holder and 2 different kinds of nibs – 6 in total + the price is very affordable, around 12$! This set is great! It includes an oblique holder, 3 different kind of nibs and a small black ink bottle. The price on this one is slightly higher compared to the Speedball but it includes the ink which the Speedball doesn’t. In case you are interested in crafting your own set you can simply buy the parts separately. The look of traditional scripts can also be achieved with felt tip brush pens. Along with your holder and nib you will also need some ink (duh). The last part we are going to talk about are the pens for modern calligraphy and other experimental styles. For modern calligraphy it seems that the most popular tools are felt tip brush pens. We wrote 2 review post on the top 5 best brush pens that you can start with, and if this is the direction you would like to start with i would recommend you checking them out. In case you are really on a tight budget and you want to start right away creating some satisfying thick and thins, you can always start with a pencil. WHAT OTHER TOOLS DO YOU NEED TO START? Ok so we covered the basic writing tools but we still need a few more things before you can start practicing. We already wrote a more extensive guide where we talk about the different types of papers and which one you should get depending on the tool that you use. Since you’re already here im just going to mention a few recommendations. When you are dealing with calligraphy there is an absolute must for paper – it has to be bleed-proof! HP Premium 32 – great for printing practice sheets! These are great papers for practice, however, for finished work you should use thicker paper as the above mentioned ones tend to wrinkle easier. YOU NEED GUIDELINES FOR CALLIGRAPHY!! You can’t eyeball your letters especially as a beginner, you need guidelines – period. They will make your life so much easier and you will improve much quicker with them. There is an awesome ruler that i constantly recommend, a ruler made specifically with the purpose of drawing parallel lines quickly and efficiently. Aside from the paper and the rolling ruler you will also need a pencil and an eraser to draw your guidelines. If you are a beginner, ask yourself what kind of calligraphy would you like to practice before you purchase any kind of pen. As i said, you really don’t need to spend a lot of money in order to start, and i would advise you to get just the very fundamental tools. After the first few months of consistent practicing you will start to develop a feeling for calligraphy and your own personal style, and at that point you can start considering to expand your toolbox. You should definitely join our Facebook group where you can share your work, ask questions, get feedback, network with other lettering and calligraphy artists, and much more.